This new commissioned artwork explores the ongoing survivance of the Indigenous peoples of Ktaqmkuk (Newfoundland) through exploring depictions, myths, truths, and the written/recorded "history" of the Beothuk and the Mi'kmaq. 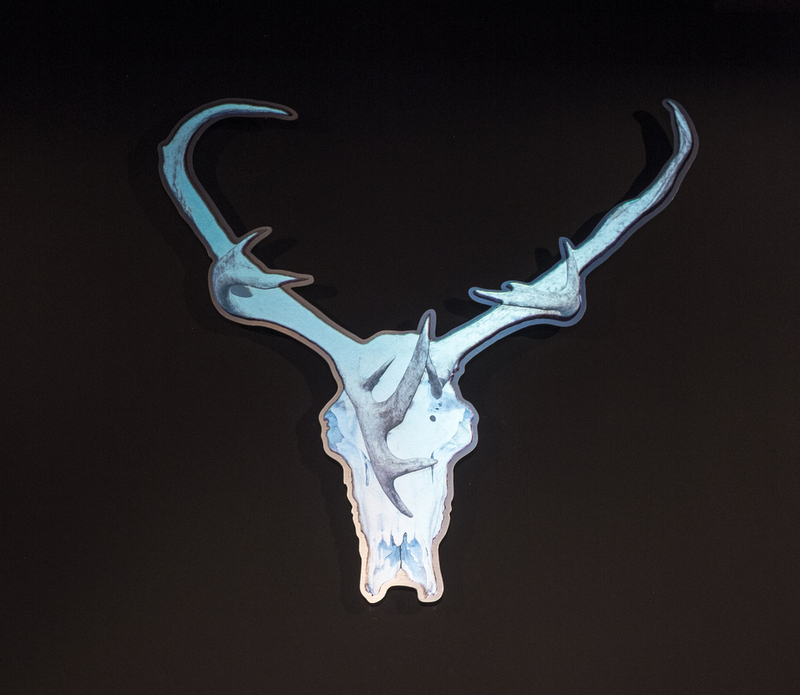 Through the use of photographs on aluminium, video projection and printed canvas the piece challenges the falsehoods claimed by written colonial history of the indigenous presence of Mi’kmaq on the island and the perspective and political atmosphere around the validation and classification of the Beothuk and Mi’kmaq. Both figures dressed for hunting hold official government issued documents of acceptance or denial of their known familial ties to their Mi’kmaq heritage. At the same time they hold under great pressure a digital oil painting of the Newfoundland and Labrador coat of arms, a commentary on the exotification, exploitation, and commodification of Indigenous cultures. The piece is a direct criticism and recreation of the Newfoundland and Labrador Coat of Arms granted in 1638, second oldest to the province of Nova Scotia's, both of which still in use. These are the only two provinces in Canada to depict the local Indigenous people supporting the escutcheon rather than animals of the region or from mythology on their coat of arms. The Newfoundland and Labrador coat of arms, which is a "fanciful 17th-century English interpretation(s) of Newfoundland's Native peoples" depicts two Beothuk, a nation who was systematically hunted and introduced to disease and starvation by settler populations and the Nova Scotia coat of arms which depicts a lone Mi’kmaq and a unicorn. The title, tamiow tle’owin is a Mi’kmaq phrase translating to Where do you belong? or Where are your roots from? to counter the motto Quaerite prime Regnum Dei which is quoting Matthew 6:33 from the Bible meaning "Seek ye first the kingdom of God”. Photos on Aluminum with Video projection mapping, print on canvas. ACKNOWLEDGMENTS: JERRY EVANS AND FAMILY, STEPHEN FOSTER, ASHOK MATHUR, UNIVERSITY OF BRITISH COLUMBIA OKANAGAN. COMMISSIONED BY: The Campbelltown Art Centre in partnership with UNSW Art and Design, Canada Council for the Arts and Winga Myamly Reconciliation Group. Campbelltown Art Centre is a cultural facility of Campbelltown City Council and is assisted by the NSW Government through Arts NSW. This project is assisted by the Federal Government through Australia Council for the Arts, it's funding and advisory body. IN THIS PROGRAM WE MEET 10 ABORIGINAL ARTISTS FROM TWO CONTINENTS - AUSTRALIA AND CANADA - AND FIND A SHARED HISTORY OF BRUTALITY.